The story of the Chrysler Royal, the low-priced, customer-winning 6-cylinder produced from 1937 to 1942 and again from 1946 to 1950, actually begins with the Chrysler Airflow. From 1934 to 1937, Chrysler produced a killer car — design-wise. The Airflow was the first American full-size production car to use aerodynamic styling. The car was all-steel construction and its bulk was in the front. The engine was moved ahead over the front wheels and the rear seat ahead of the rear axle, lowering its center of gravity and "cradling" passengers in the car. Its hood had an impressive waterfall grille, its headlamps were flush-mounted, and its doors and seats extra wide. It was much stronger and weighed less than earlier models — and it set speed records. The trouble was, Chrysler (after years of effort) was not really ready to produce the Airflow and customers weren't ready for its modernistic design. All the retooling (including allowance for new welding techniques) necessary to bring out the new car meant significant production delays — and the earliest models had so many defects that some engines broke loose from their mountings at 80 mph. Rumor had it that the newly-designed body was unsafe, and customers believed the rumor. Sales were poor, the Economy Six outselling the Airflow by more than 2-1/2 times. Discouraged, Chrysler designers introduced modified "Airstream" features into its '35 and '36 models, keeping the pontoon fenders and rearward-raked radiators — and those sold a bit better. By 1937, however, Chrysler, still looking for improved sales, brought out the six-cylinder Royal, C-16, to replace the Chrysler Six. The Royal had a shorter chassis, bullet-shaped headlights high on the front fenders, and a front grille with horizontal bars. It also came with new built-in windshield defroster vents and safety padding on the back of the front seat. Completely insulated by rubber, new body mountings gave a smoother, quieter ride. Aero Hydraulic Shock Absorbers further helped cushion the bumps. Its gas-miser Gold Seal engine with, as one ad put it, the "highest compression for its bore the world has yet seen", produced 93 hp. 199 inches long, on a wheelbase of 116 inches, the two-door business coupe went for an affordable $810 while the top-of-the-line convertible sedan sold at $1355. Chrysler was enthusiastic in marketing the Royal, its copy writers utilizing lots of exclamation points to attract customers: "Be Modern. Buy Chrysler!" "Real racing yacht smartness with house-boat comfort!" "Positively regal trim! Appointments right out of custom cars!" This was a "low-priced fine car. . . new style from bumper to bumper! . . . a big, roomy car. . . a power-packed economy car!" Ladies (you could tell because they were wearing gloves) were featured in ads for the "entirely New Chrysler. . . in the Low-Priced field" that was both comfortable and luxurious. Its options included some finer appointments, too — like a clock, heater, and radio. The 1938 Royal, C-18, ad campaigns continued, touting: "A Great Big Beauty at a Mighty Small Price!" "$1010, the low-priced field" , and "Style! Commanding Size! Regal Luxury! All are yours at surprisingly low cost in the Great Chrysler Royal!". Since Chrysler sponsored the weekly radio program Major Bowes' Original Amateur Hour (precursor to today's shows like "America's Got Talent"), every Thursday evening you could learn more about what the Royal had to offer. This was Chrysler's 10th Anniversary line (reflected in the $1010 come-on price), and the '38 Royal came equipped with lots of improved features. It had a new grille with horizontal bars filling a shield-shaped opening, a vertical center molding, and a chrome chevron below the grille. Its torpedo-like headlights sat atop the fenders. The wheelbase was increased by three inches and there was a side-opening hood. A new steering wheel came with a chrome horn ring, and rubber-insulated steering was introduced. The newly-designed Gold Seal engine developed 95 hp. A Fluid Drive liquid clutch was added, eliminating metal-to-metal contact between motor and driving wheels. Instead, a pair of turbine fans run opposite one another in an oil bath. Two shallow, finned cups faced each other a quarter inch apart. As the engine turned over, the front disc (attached to the crankshaft) rotated. The oil it displaced was thrown against the fins of the rear disc (attached to the drive shaft), turning it in tandem. A driver could start and stop without using the clutch. The car's exterior was smartly fitted out, as well, with "Super-finish". Chrysler claimed the super-smooth finish had no scratch deeper than a millionth of an inch. 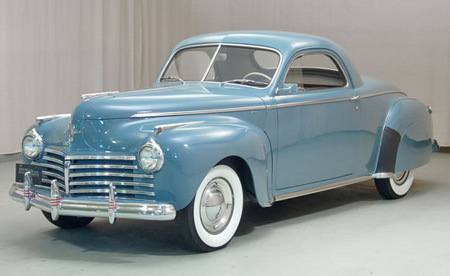 Noted Chrysler designer Ray Dietrich began to tune up the Royal, C-18, for the 1939 models, with Robert Cadwaller completing the task once Dietrich left the company in mid-1938. The Royal C-22 was left with a more conventional grille and an overall design you might call stodgy, even boring — but it was accepted easily and the '39 was a commercial success. Despite its more conventional style, ads proclaimed the Royal's modernity: "Be Modern — Buy Chrysler! "; [It's the] "sleekest, most dashing-looking car that ever took the road." Its new Cruise and Climb overdrive transmission was heralded as a transmission "that thinks for you". To actuate it, you took your foot off the gas pedal momentarily, and to disengage it, you depressed the gas pedal to the floor. As an option, a column shift was introduced — much to the relief of the middle front seat passenger used to straddling the floor-mounted shift column. There was also a flush-mounted plastic instrument panel which contained a Safety Signal speedometer to warn you of dangerous driving speeds — an amber light came on at 30 mph and a red one at 50 mph. There was a 100 hp engine, a 119-inch wheelbase, and a pointed ship's prow front with a vertical chrome strip that came up the leading edge of the hood and continued after the hood ornament up to the cowl. To enhance its appearance further, a long molding strip ran along the side of the hood and three horizontal slashes were placed near the cowl. Roof and trunk lines were tapered. The car was four inches wider than the '38, flared lower door edges made the running board appear narrower, and there was more luggage space. The windshield was vee'd with a middle divider, headlamps were moved a little further out and faired into the fenders, and tail lights were mounted into the crease lines of the rear fenders. There were push-button door locks, and cushioned "chair-high" seats "as wide as divans" provided more space and comfort. Though likely the only real comfort he wanted was that of knowing how to drive, it is said that Johnny Carson's learner car was a '39 Chrysler Royal. With the 1940 Royal, advertisers were back at work with these lines: "I never knew you could buy that handsome Chrysler Royal Sedan [Series 25] for $995, delivered in Detroit! "; "There's a whale of a lot of satisfaction in Chrysler's get-up-and-go. "; and, alongside a featured aerodynamic plane and train, "It's Racy! It's Roomy! It's Better!" The Royal had cloth or mohair-upholstered, wider "Air Foam"-cushioned bench seats front and rear. It rode on a longer wheelbase with notchback profiles, separate fenders, and smooth lines. It had a longer hood; big, wide doors "like house doors"; more massive fenders with recessed headlamps; and sealed beam headlights. Horizontal grille bars ran across the lower half of the radiator, and the model name appeared on each side of the hood at its forward end. Two-tone paint was available as an option. Powered by a more powerful Speedking engine, its passengers were "cradled in the middle of the car. . . away from the bouncing rear axle." Red signal lights on the oil, thermometer, and fuel gauges were introduced to warn the driver when something went wrong. Chrysler's big news in 1941 was the Newport and the Thunderbolt, its first-ever concept cars, designed by Ralph Roberts and Alex Tremulis. These cars had fender lines that flowed from front to rear, with no body seams visible and no ornamental glitz — just an aerodynamic, uninterrupted line stem to stern. There were envelope fenders, no door handles (just pushbuttons), enclosed front and rear wheel wells, and concealed headlights. The fresh design impacted the Series 28-Six Royal, as well, and led to some simplifications. Its body was slightly wider and lower, though an inch shorter, and there was more glass area. The grille was altered, too: rather than nine horizontal grille bars, there were only six with wider spaces between them. A new "spitfire" engine produced 102 hp and the optional three-speed overdrive "Vacamatic" transmission made the car a semi-automatic with two low and two high gears. The Drivers had the option of cars with or without running boards. Costs ranged from $995 for the two-door business coupe to $1415 for a four-door limo. As always, the four-door sedan was the best-selling Royal. The early '42 Royals were produced with blackout trim (painted metal) rather than chrome trim due to strategic need for chrome during the build-up to WWII. Five horizontal grille bars went across the front end and wrapped around to the front fenders, and a sleeker hood opened from the front (alligator style) rather than from the sides. Running boards were hidden beneath flared door bottoms. By February, 1942, civilian production ended and Chrysler went to work building marine engines, harbor tugs, radar units, and tanks. Left-over inventory had it place, as well; Patton's staff car, for instance, was a 1941 Chrysler Royal. As with many models, the War's end saw an explosion of pent-up demand from customers and manufacturers rushed to produce previously-designed models. 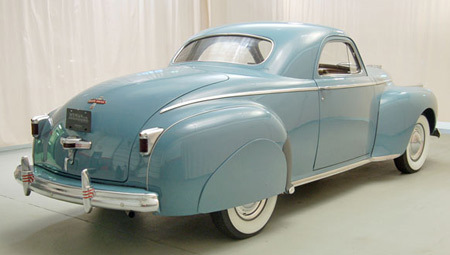 The 1946 royal, based on the '42 design, was the least expensive Chrysler car and drew lots of attention. It sported newly-skinned front doors, new front and rear bumpers with different fender trim, and an egg crate-style grille. The few postwar improvements were a permanent Oilite fuel tank filter and Safe Guard hydraulic brakes. Standard equipment encompassed additional features, too, including armrests on both front doors, cigar lighter with lighted ashtray, glove box light and lock, luggage compartment light, and dual 2-speed windshield wipers. The '47 royal line continued with only slight design changes and a small weight increase. And 1948 brought additional paint colors and larger, low-pressure tires. In 1949, however, for Chrysler's 25th anniversary, there was all-new styling: a simplified egg crate grille and taller and boxier body. For the first time since 1942, there was also a Royal station wagon. The last year of Royal production was 1950, and that year's model was bolder, with a heavier-looking egg crate grille, a three-piece rear window, and a license plate move — from the deck lid to the center of the rear bumper. While ads called the '50 the "most beautiful Chrysler ever designed", the following year it was replaced by the Windsor which had become Chrysler's low-priced series.